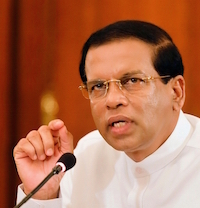 President Maithripala Sirisena has taken a tough stand against a group of dissident Sri Lanka Freedom Party (SLFP) MP’s who are planning to sit in the opposition warning them that even though they have more MP’s than the TNA the group will not be given the opposition leaders post. Sirisena has emphasised that the TNA leader R. Sampanthan will continue to be the opposition leader in parliament. Around 30 Sri Lanka Freedom Party (SLFP) parliamentarians who are against the national government created by their party and the United National Party (UNP) had met the President yesterday to convey their decision to sit in the opposition. An offended Sirisena had told the group that he would inform the SLFP General Secretary Duminda Dissanayake about those who wish to sit with the opposition. Earlier over 30 SLFP MP’s had held talks with former President Mahinda Rajapaksa, according to reliable sources. According to an MP from this group they will act as a separate group in parliament. The Kalutara district SLFP MP Kumara Welgama is tipped to be the leader of this SLFP dissident faction which will operate with the blessings of Rajapaksa. However, according to the MP, Welgama will be only a figurehead as the true leader of this rebel SLFP faction will be Rajapaksa. The leaders of other UPFA affiliated parties such as Wimal Weerawansa, Vasudeva Nanayakkara, Dinesh Gunewardena and Udaya Gammanpila too will support this group. An expected, even logical progression. Better move the flies into the opposition benches before they spoil the soup. Where will Mahinda, Namal and Chamal sit? Will they try to keep the cake, while eating it too! Just dump them. Let them bark.They will look lore and modayas every day even for the modayas who voted for them. Short life for these thirty scoundrels really, as when the investigations are completed, the majority of them will be in jail. The replacements for these criminals will surely be a cleaner group in line with the President’s thinking. Rajapakse’s only interest now in sitting in the opposition is to see how he can protect his family from prosecution. RW and MS must remember that they will be under the citizens radar on this issue as the country wants to see all these crooks behind bars. Sirisena’s dictatorial characteristics are coming out slowly…he is giving freedom to the websites and the internet but he is squeezing the neck of the representatives who wants to stand by the mandate given by the people/constituent and represent their voice in the Parliament. The people who voted for these representatives have vehemently opposed a national government. So it does not matter what the representatives think they must abide by the wishes of the people. I seriously do not think Sirisena can control any of these MPs…time will tell for sure. The best thing Sirisena can do is to be an Independent President or join the UNP and be the UNP President. It is more and more evident who in the most powerful man in the government. Sirisena says that the Central Bank Governor should not have been appointed and even told RW to remove it…But RW dismisses Sirisena and has kept the governor in place…This is a real Comedy…..in vain Fredy Silva died..may be Sirisena can get Mervyn Silva in the absence of Fredy to act in this Comedy. Would you like to review what you have typed above in the comment section? True did not review and there were some mistakes. Should have reviewed it. :-) But the stated facts remain the same. If you want to talk about dictatorial characteristics, then you have to talk about MR and not Sirisena. Appointed the TNA leader as opposition leader. Why is Sirisena doing this? He wants to make sure that the UPFA rump and MR’s cronies will not rock the boat. He wants to stabilize his government to run it smoothly for the next 5 years. All the above that Sirisena did and doing are necessary and important to govern the country peacefully. the greater interest of a stable governance. So you agree that MS is as a dictator. There is no point justifying why he is doing that the basic fact is he is acting as a dictator. Majority of SLFP and UPFA MPs are with the government. So UNP and SLFP or UPFA are part of the government. No party can be in power and in Opposition. That leaves the third largest party to form the Opposition. Only way left to the opposing SLFP or UPFA MPs to claim the right to Opposition is to break away from the majority of MPs of their present party and form another party and be in the Opposition. Dinesh what you have written is the comedy. These rebels probably wanted Sirisena to give them also some ministries, when they found it was hard to get. This is their threat, to sit in the opposition and wanted the leadership for M R,Sirisena was right not complying to their threat. You should read what Amerasiri has said. This is the beginning. There going to be 49 sitting in the opposition with the 38 SLFP+ Wimal and gang. This will grow. Prince Zaid has already opened the tap with his one sided report. Any action on the UN Report will increase the opposition. All the inquiries against Mahinda Rajapakse, Gotabaya Rajapakse, Apavithra Wanniarachchi, Wimal Weerawansa, and Gamanpilla should be fast tracked and proven and punished. These jokers are not allowing Sri Lanka to progress. Mr. President: Why wait? Allow those people to go wherever they want to go. We also will get a chance to see who those people and with whom they are with – perhaps and most probably with Wimal, Dinesh, Vasu, Gammanpila, Welgama. They know what is in stock for them the moment they leave the UPLF. Let the SLFP be cleaned and stand up again as a “Political Party”. Besides the tough talk of My3 should the dissident group create a new party, then My3 will have no choice but to hand the opposition leadership to Welgama. If My3 refuses to do so a court challenge will ensure he does so. No matter which way the dissident group chooses to travel, their best chance of survivel is being within SLFP. They know it too well. All that they are trying to do now is spoil the party for the UNP/SLFP coexistence and My3’s hold on power. With every passing day the dissident group are losing credibility with or without MARA’s underhand machinations. Barking dogs never bite.If they want to sit in the Opersition why you worry.